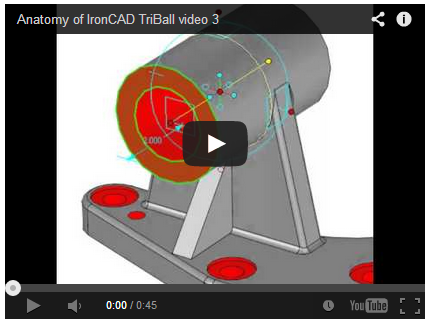 IronCAD’s TriBall interface has the distinction of being the very first cursor in CAD that went beyond simple crosshairs. Back in 1995, when IronCAD first launched under the name of Trispectives, the world had never before seen a user interface this advanced. The TriBall acts as a very smart 3D cursor, so smart that it should be considered a tool in its own right. 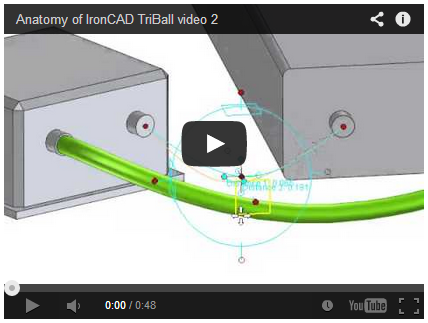 Indeed, it is a key feature of IronCAD software. In this article, I will tell you about it, and through videos show off some of its unique capabilities. IronCAD is MCAD software that does parametric feature-based 3D modeling, and is also well known for its innovative part design where it can mix both parametric and direct face modeling allowing the best of both capabilities to be used. 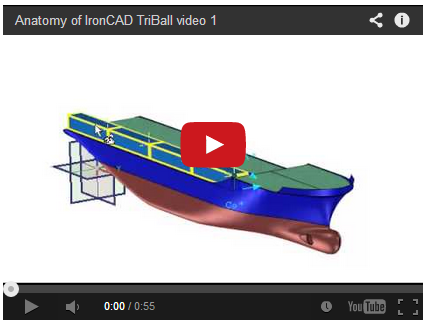 The simplest way to describe IronCAD’s TriBall is that it is a positioning tool for moving elements into and around the model. OK, fine, but it is much more than just that. 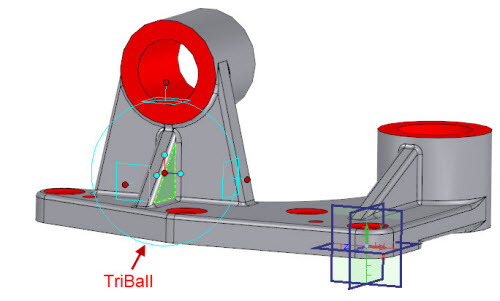 The TriBall is also very effective for editing models imported from different CAD systems. In this case, the TriBall aids us in direct modeling operations and history-free editing. We use it for moving holes, drafting or moving faces, and so on. I will get to an example of this later in this article. For now, though, let’s take a look at what the TriBall consists of, and break down the components (see figure 1). After right-clicking on the inner orientation handles of the TriBall, there are many options available for very precise positioning. Listed below in figure 2 is a table of the specific positioning behaviors (which I extracted from IronCAD’s help pages). From this, we can see that the TriBall handles manipulations, such as alignment and mirroring. 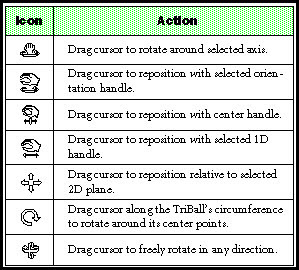 Shown below in the table are the hand gesture icons that we use while operating the TriBall (see figure 3). Poking at the TriBall, pushing-pulling faces, hand gestures – it’s like we’re inside the screen working on the solid model with our hands. With this background out of the way, let’s see the TriBall in action. I have put together a few videos to demonstrate it. Keep in mind that the TriBall is not the only tool for performing these operations in IronCAD, but it is the most versatile one. In my first example, I will use the TriBall to replicate the containers on a ship. Figure 4 shows before (a single container placed) and after the operation (a ship filled with an array of containers). Next, I would like to demonstrate for you how the TriBall creates and positions 3D curves (see figure 6). These are useful for tasks in MCAD, such as creating animation paths, placing cable and wire runs, or inserting tubing and piping. 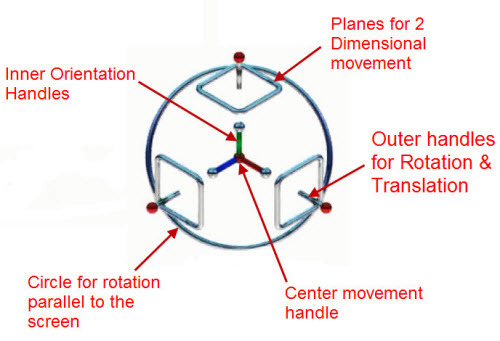 The example shows how the TriBall is powerful in manipulating in 3D space without the need for planes. The video is shown in figure 7, using TriBall for placing 3D curve. The final example I show is how to use the TriBall to directly edit models in IronCAD – otherwise known as history-free editing (see figure 8). Honestly, this function is what made IronCAD (nee Trispectives) famous following its launch in the 1990s, along with the TriBall interface. In the video shown in figure 9, I make some changes to the model. I move a face, and then rotate the face – my favorite. 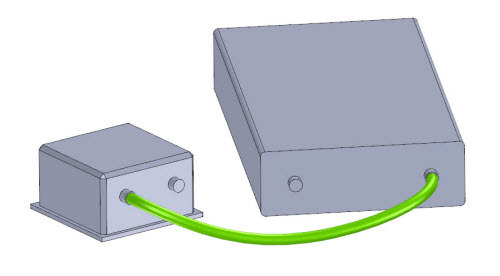 This editing is being done directly on the model, and is necessary due to this model being imported from another CAD system – and so it has no history although this can also be performed on native IRONCAD models as well. TriBall-style technology is showing up competing MCAD software programs more and more, as CAD vendors mimic the head’s-up approach pioneered by IronCAD’s predecessor. In my experience, though, the TriBall is a more complete and versatile implementation of the tool. The TriBall is a very effective and versatile tool for positioning of components, alignment of components, creation of new components and editing of imported models or dumb solids. This article covers some of the basics concepts of the TriBall however the advance cases it can handle for positioning and creation of geometry is endless.